I am very excited to announce becoming a new @Diamondsunleashed Ambassador. Their diamond collection can be seen on @HSN and in @NeimanMarcus. We are empowering women to unleash their potential. Proud to be joining influencers Serena Williams, Martha Stewart and more. 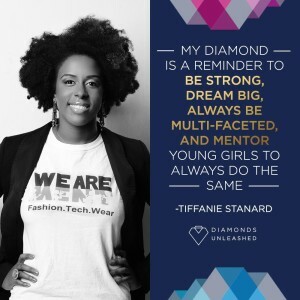 DIAMONDS UNLEASHED has partnered with over 250 high profile women ambassadors across the landscape – finance, entertainment, fitness, business, athletes and artists. Ambassadors include finance industry veteran Sallie Krawcheck, actress and activist Maria Bello, singer-songwriter Melissa Etheridge and fashion industry veteran Fern Mallis to name a few. This amazing network of “Stilettos on the Ground” will work to help create awareness about the project and its efforts.